Hemophilia is a common hereditary bleeding disorder that characterized by hypocoagulability. It was believed that hemophilia patients are protected against cardiovascular disorders. However, with advances in hemophilia management, the life expectancy of such patients improved, and cardiovascular diseases have been emerged as a common cause of death in adults with hemophilia. Hemophilic patients have atherothrombotic events, and higher prevalence of hypertension as general population 1 . Early identification and proper management of such complications is an area of great interest in recent years. However, there is limited data exploring the frequency of cardiac affection among children with hemophilia especially those evaluating right ventricular function 1 . Echocardiography is a non-invasive imaging that widely used for assessment of cardiac function. Recent modalities in echocardiography including myocardial deformation imaging using TDI-derived strain and two-dimensional strain allow more accurate evaluation of cardiac structure and dynamics 2 , 3 . Cardiac biomarkers provide additional tool for detection of cardiomyocytes injury that helps in understanding the underlying pathophysiology. Combination of different echocardiographic modalities together with cardiac biomarkers provide comprehensive assessment of cardiac function in high risk population 4 . Troponin I is a highly specific intracellular cardiac molecule that leaked into the circulation due to cell injury even in the absence of necrosis or apoptosis. It is commonly used marker of myocardial damage in both acute and chronic situations 5 . The current study aimed to evaluate RV function in children with hemophilia using different echocardiographic modalities and measurement of Troponin I. The aim of this study was to evaluate right ventricle (RV) function in children with hemophilia and its correlation with a cardiac biomarker troponin I.
Sixty male children were enrolled in this study and divided into two groups. Study group(GI): included 30 male children with hemophilia A on demand treatment and under regular follow up were selected from the pediatric hematology out-patient department (OPD), of Al-Nile hospital, Shobraelkhima, Qalubia from December 2015 to May 2016. Control group(GII): included thirty apparent healthy children. They were selected consecutively from out-patients of pediatric clinic of Al–Zahraa University Hospital. The control cases had no acute or chronic systemic illness, renal impairment; hypertension or structural heart disease confirmed by full history, examination and echocardiography. The study was carried out in Alzhraa university hospital, faculty of Medicine for girls, Al-Azhar University, Cairo, Egypt: Cardiology Pediatric and biochemistry departments. All subjects' parents were informed of the purpose of the study and verbal parent consent was obtained in adherence with the guidelines of the ethical committee of AL-Azhar University, Cairo, Egypt. Children with hemophilia who had history of congenital heart disease, significant valvular heart disease, significant arrhythmias, renal, metabolic, hematologic other than hemophilia or endocrine disease and other cause of bleeding disorders were excluded from the study. All the studied children were subjected to a full history with special emphasis was made on demographic data (age), a detailed history of hemophilia type, factor level, age at diagnosis, age at start of treatment, type of treatment (receiving fresh frozen plasma, cryoprecipitate, factor VIII), amount of factor usage per year and the duration of factor usage. Thorough clinical examination included anthropometric measurements (weight, height and body mass index) and systemic examination (chest, CVS, abdominal and CNS including blood pressure measurement). Five ml venous blood samples were withdrawn; 2ml for complete blood picture were taken on EDETA solution. 3ml of the samples were left to clot and sera were separated without delay for the biochemical parameters to be done on the same day. Routine investigations: complete blood picture, serum cholesterol, triglyceride, high density lipoprotein (HDL) and low density lipoprotein (LDL). Lipid profile was measured using an autoanalyzer (Beckman Coulter Synchron CX 9; Beckman Coulter Inc., Mallaustrasse 69-73 68219, Mannheim, Germany). For cholesterol measurements. Serum total cholesterol,HDL and LDL was determined by a commercial kit (Boehringer-Mannheim, Germany) 6 . The concentration of triglycerides(TG) was measured in a TechnoConAutoAnalyzer II (TechnoCon Instruments, Tarrytown, NY, USA). b) Assessment of Cardiac troponin I: Using Enzyme-Linked Immuno-Sorbent Assay (ELISA). Product number: AL3011 HV/C/F. Trans-thoracic echocardiography (TTE) examination was performed for all patients and control subjects in both supine and left lateral position, all measurements were made by one staff cardiologist over at least three cardiac cycles and the average value for each parameter was calculated. Using GE system Vivid-S3, Matrix probe M3S multi frequency 2.5 MHz, with the capability of tissue Doppler imaging and gray scale recording for speckle tracking study. Comprehensive TTE M-Mode, 2D, Doppler (pulsed and continuous wave), color flow mapping in the standard views (parasternal long axis, parasternal short axis, apical four, three and two chamber views) from all accessible windows were obtained with ECG physio signal displayed with all detected echo-Doppler study with Loop recording of 2-3 cycles. All images were digitally stored for later off line analysis at echoPac.GE version 110-1-2. All parameters were taken according to standards of the American Society of echocardiography (19) to measure right ventricular (RV) dimensions and functions including conventional Doppler [Tricuspid valve early diastolic velocity (RV E vel), tricuspid valve late diastolic velocity (RV A vel), RV E/A ratio, RV deceleration time and RV-Tei index]. The TDI was obtained from apical 4-chamber and 2-chamber views. For data acquisition, three complete cardiac cycles were collected and stored in a cine loop format. The image sector width was set as narrow as possible to allow a frame rate acquisition greater than 90 frames/s. Special attentions were paid to the color Doppler velocity range setting to avoid any aliasing within the image. The tricuspid annular systolic velocity (TV-Sa) and tricuspid annular early diastolic velocity (TV-Ea) by pulsed wave tissue Doppler was obtained at inferoseptal, lateral, inferior and anterior annular positions then average, average Ea/Aa ratio and TV-E/Av-Ea ratio was calculated. The LV longitudinal strain was also assessed using 2D STE analysis with QRS onset as the reference point, applying a commercially available strain software package to the LV on echoPac version 110.1.2. Images were acquired at 70–90 frames per second at end-expiration in the apical 4-chamber, 3-chamber and 2- chamber views. Using the Automated Function Imaging software (AFI), a point-and-click approach was utilized to identify three anchor points (two basal and one apical), following which the software tracked the endocardial contour. The RV2D ST GS% was obtained in all study cases automatically. Statistical analysis was performed using the Statistical Package for Social Sciences (version 16.0; SPSS Inc., Chicago, IL, USA). Data are expressed as the mean± SD. The 1-sample, Kolmogorav-Smirnov test was used to evaluate the distribution of variables. Differences between groups were analyzed with unpaired student t ‑test. Possible associations were assessed by Pearson and Spearman coefficients of correlation. p -value≤0.05 or confidence interval CI≥95% was considered significant. A logistic regression model using multivariate analysis was used to study the relations between various independent variables. ROC curve was plotted to define the cut-off value and its sensitivity and specificity. We enrolled a retrospective observational controlled study that included 60 children, divided into two groups; GI represented 30 male children with hemophilia A with mean age of 11.14±2.39 years old compared to GII that included 30 age-matched male healthy subjects as a control. In hemophilic children the mean value of factor VIII level was 6.75±3.1. According to the factor level, 3 patients (10%) had severe hemophilia (Factor level <1%), 15 (50%) had moderate type (Factor level = 1-5%) and 12 (40%) had mild type (Factor level >5%). The mean duration of illness and treatment /monthswas 143.3±14.94 and 125.6±15.6 respectively. Baseline demographic, clinical and laboratory data of the enrolled children were demonstrated in ( Table 1 ). 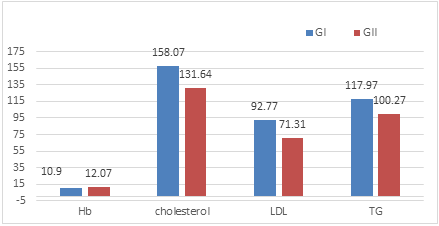 There were a significant difference between both groups only in Hb level ( p <0.001), total cholesterol level (p<0.001), LDL ( p <0.001) and triglyceride level ( p <0.001) as shown in Figure 1 . No significant difference regarding z score of anthropometry. We found that 16 child with hemophilia (53.33%) had RV systolic dysfunction defined by RV Sm<11.5cm/s and 2 children (6%) defined by 2D-RVGLS<-21% with significant difference between patients in comparison to their controls ( p ˂0.001) for both parameters. Despite that no patient had TAPSE<16.5mm,there were significant difference between both groups ( p =0.05), we found. 28 patients in GI (93.33%) had impaired global RV function defined by TD-MPI>0.37and 13 patients (43.33%) by PW-MPI with significant difference between both groups. ( p =0.05 and 0.04, respectively). 26 child in GI (86.66%) had RV diastolic dysfunction defined by E/Em>6 ( p ˂0.001). When measured by pulsed Doppler, only 3 patients (10%) had E/A <0.8 (relaxation abnormality) with statistical significance between both groups ( p =0.04) as shown in Table 2 & Figure 2 . We reported that 7 children in GI had RVSP≥35mmHg with a highly significant difference between both groups (31.23±4.01 vs 23.17±2.98, p< 0.001). We found a significant negative correlation between RVSP and RV Sm (r=-0.622, p <0.001) and RV GLS (r=-0.307, p=0.03) while positive correlation with RV E/Em (r=0.620, p <0.001) and RV TD-MPI (r=340, p=0.01). There was a negative correlation between severity of hemophilia defined by the factor level and 2D RVGLS (r=-0.433, p=0.02) as shown in figure 3. We found that cardiac Troponin I was significantly increased in hemophilic children in comparison to healthy controls (0.95±0.04 vs 0.63±0.05, p <0.001) ( Figure 3 ). 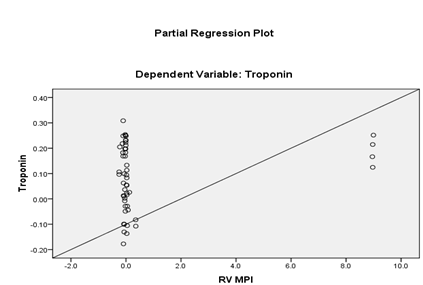 Cardiac Troponin I had a positive correlation with RV PW-MPI index (r=0.287, p =0.04), RV E/Em (r=0.505, p <0.001), RV TD-MPI (r=0.795, p <0.001) and RVSP (r=0.640, p <0.001). It also had a strong negative correlation with RV Sm (r=-0.750, p <0.001), 2D RVGLS (r=-0.534, p <0.001) and IVSd (r=0.682, p<0.001). We performed a logistic regression with multivariate analysis backward method to determine the strongest predictor of cardiac Troponin I. We included RV Sm, 2D-RVGLS, RV E/Em, RV TD-MPI as independent variables. The analysis revealed that the most significant factor affecting cardiac Troponin I in children with hemophilia was RV TD-MPI ( p <0.001) as shown in Figure 4 . We plotted ROC curve to define the cut-off value of cardiac Troponin I that can predict RV affection in children with hemophilia. We found that value was 0.74 ng/ml with AUC=0.646, 53.33% sensitivity and 71.34% specificity. The PPV was 72.73% and NPV was 51.72% as shown in Figure 5 . Table 1 Baseline demographic, clinical and laboratory data of the studied groups. Table 2 Baseline echocardiographic parameters of the studied groups. Figure 2 Comparison between the studied groups regarding echocardiographic parameters of RV function. 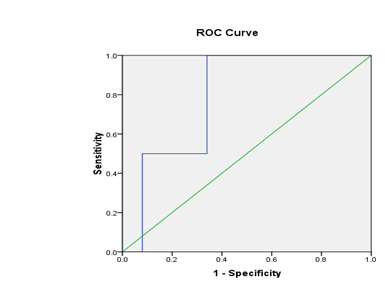 Figure 5 ROC curve of cardiac Troponin I in prediction of right ventricular dysfunction in children with hemophilia. Despite advances in understanding of pathophysiology, risk prediction, and prevention of CVD in many chronic illnesses, limited data regarding hemophilia are available and most of studies are descriptive 7 . The RV has unique structural and functional characteristicsthat represent an important marker of morbidity and mortality. Echocardiographic assessment of RV function is more challenging than the left ventricle 8 . In the current study, different modalities of echocardiography were used to assess RV structure and function in children with hemophilia. To the best of our knowledge, this is the first study to evaluate RV functionin such children. Our study showed that children with hemophilia have significant impairment of both systolic and diastolic RV function and elevated troponin I level that was significantly correlated to hemophilia severity. 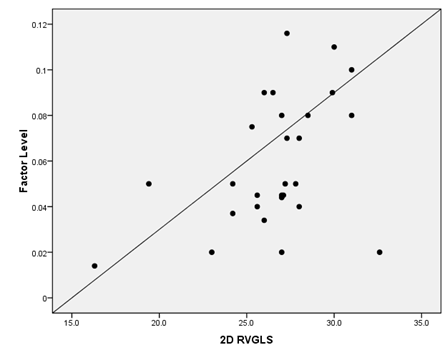 28 out of 30 GI patients (93.33%) had RV Sm<11.5cm/s and 2 children (6%) had 2D-RVGLS<-21%. 28 out of 30 GI patients (93.33%) had impaired global RV function by TD-MPI>0.37 and 13 child (43.33%) by PW-MPI. 26 patients of GI (86.66%) had RV diastolic dysfunction measured by E/Em>6 while only 3 children (10%) when measured by pulsed Doppler E/A<0.8. In agreement with our findings, Amoozgar and collegues have demonstrated significant higher interventricular septum thickness during diastole using M-mode echocardiography and late diastolic velocity of septum, lateral mitral valve systolic, late diastolic velocity of lateral mitral annulus (Aa), and late velocity of tricuspid (Aa) using Tissue Doppler echocardiography were significantly impaired in adults with hemophilia in comparison to healthy controls 9 . Recent evidences showed that theincidence of ischemic CVD in hemophiliapatients is increasing, because life expectancy of these patients to be similar or even greater than that of the general population 10 . Previous literature has recommended routine screening for cardiovascular disease for hemophilia patients after the age of 40 years. However, no available data evaluate early prediction of such risk among children 11 . Sharathkumarand collegues havereported that patients with hemophilia have two folds higher prevalence of coronary artery disease, stroke and myocardial infarction than those without hemophilia 12 . Another study hasfound that cardiovascular comorbidities were greater in hemophilia A patients 13 . Kulkarni and collegues havefound that the prevalence of coronary heart disease was 0.05% in hemophilic patients under 30 years of age and 15.2% in those aged 60 or more 14 . The prophylactic transfusion replacement therapy in subjects with hemophilia can trigger myocardial ischemia and increase the incidence of myocardial infarction 15 . Girolami and collegues havereported that the majority of thrombotic cardiovascular events in hemophiliac subjects occur during infusion of recombinant FVIII or DDAVP therapy 16 . Additionally, the risk of developing atherosclerosis and associated cardiovascular disease appears equivalent in patients with hemophilia in comparison to age-matched males in the general population which add more risk of myocardial impairment among such subjects 17 . Elevated circulating factor VIII levels and other coagulation factors is considered risk factors for cardiovascular disease. It was hypnotized that low factor VIII levels may reduce the likelihood of thrombotic events, thereby, decrease the incidence of cardiovascular morbidities in subjects with hemophilia 6 . The previous data explain the negative correlation between severity of hemophilia defined by low factor VIII level and 2D RVGLS in our children. Quader and collegues have reported that three heart transplantations have been performed successfully in pediatric patients with hemophilia A 18 . In the published literature, of which only 1 was supported with a biventricular device (Excor; Berlin-Heart AG, Berlin, Germany) for 178 days 19 . For heart surgery in patients with hemophilia, there are no standard guidelines for factor VIII supplementation. Common themes, as succinctly summarized by Rossi and colleagues, suggest keeping factor VIII level over 50% of normal prior to and during the immediate postoperative period 20 . Using this approach, of the 36 summarized patients who had heart surgery only 4 (9%) had significant bleeding. In general, patients who have not bled during the first postoperative week seldom bleed later. In view of this, either continuous or bolus doses of factor VIII have been used for 7 to 10 postoperative days in most surgical cases. Our patient required 3 weeks of factor VIII supplementationat the first surgery due to onset of GI bleeding. With anticipated longer wait times for heart transplantation in our state and region we elected to bridge our patient with HeartMate II. Anticoagulation, which is required to prevent pump thrombosis, has been well tolerated in patients with hemophilia who had mechanical heart valves 21 . So, in agreement with our study, patients with hemophilia are living longer and are expected to present with cardiovascular morbidities including advanced heart failure. Bridge to transplantation with a LVAD is increasingly necessary but is fraught with challenges related to pump thrombosis and GI bleeding. Major cardiac surgical procedures, as presented here, can be safely performed in patients with hemophilia with meticulous interdisciplinary planning.